Cash discounts promote early payment. 1. Is It Better to Make Payments or Pay Cash for a Car? 2. When Is Best Time to Buy a New Car? 3. How Does a Downpayment Work on a Loan? Some businesses, such as certain health care providers, offer cash discounts if you pay at the time you receive services, rather than if you wait to be billed. Other businesses offer discounts if you pay within a certain time frame. You can look at the "cash discount" price this way -- as a true discount for paying early -- or you can consider the cash price as the regular price and calculate an effective "interest rate" that you pay if you choose to forgo the discount and pay more money. 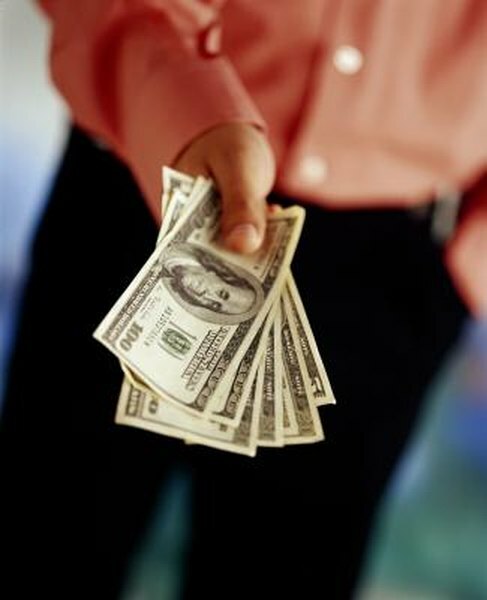 Typically, a cash discount is offered as a reward for paying sooner rather than later. For example, a merchant's terms might offer 3 percent 10 / 60, which means you get a 3 percent discount if you pay within 10 days and the full amount is due within 60 days. Merchants may offer a cash discount to give customers an incentive to pay sooner, often because they are short on cash or trying minimize the amount of accounts receivable. To figure the APR, first subtract the number of days you have to pay if you want the discount from the number of days you have to pay in full to find the number of extra days you get to keep your money if you forgo the cash discount. Second, divide 365 by the number of extra days you have to pay in full to find the number of periods per year. Third, subtract the discount as a decimal from 1 and divide 1 by the result. Fourth, raise the result to the power of the result of the number of periods per year. Finally, subtract 1. Say you have a merchant offer you a 3 percent discount if you pay within 5 days or full price if you pay within 40 days. First, subtract 5 from 40 to get 35 days. Second, divide 365 by 35 to get 10.429. Third, subtract 0.03 from 1 to get 0.97 and divide 1 by 0.97 to get 1.0309. Fourth, raise 1.0309 to the 10.429th power to get 1.3738. Finally, subtract 1 from 1.3738 to find the APR of forgoing the cash discount is 0.3738, or 37.38 percent. The effective APR varies depending on the lengths of time involved. For example, suppose that on one purchase you're offered a 2 percent discount if you pay in 10 days or the full amount is due within 30 days. On a second purchase, you're offered a 2 percent discount if you pay within 10 days or the full balance is due within 180 days. The effective APR you would pay by forgoing the first deal is higher, because when you decline the discount, you need to pay the full amount only 20 days later. For the other deal, you have 170 days before full payment is due -- the effective "interest" you pay is stretched over a longer time and therefore the rate is lower. Accounting Tools: What is a Cash Discount? Is the Face Value the Price You Pay for a Bond?